pewag acts as a full-range supplier of tracks and traction chains for forestry machines. as we have considered your needs as well as those of nature. To ensure the outstanding quality of our range, all our production facilities are still based in Central Europe, allowing us to keep an overview of the entire manufacturing process, and to offer forestry tracks and traction that create innovative solutions while also living up to the highest quality standards. 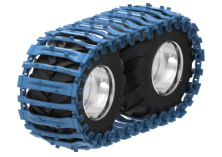 pewag bluetrack perfekt is ideal for heavy-duty applications in rocky, steep terrain. Professional forestry workers require safety and a strong grip on rough terrain. The newly developed pewag bluetrack forestry tracks offer the same outstanding product characteristics as all pewag products: premium quality, high-level durability and excellent value for the money. To fulfil a wide range of different customer requirements and operating conditions, pewag offers several product versions. pewag bluetrack duro is a true all-rounder. The track is designed in such a way that it achieves the best possible results for the user with any soil condition. pewag bluetrack flow is the forestry track of choice for use on easy terrain and with sensitive subsoil. 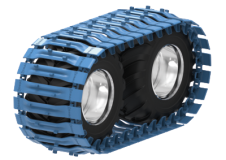 pewag bluetrack flow wide is particularly gentle on the soil and on the tires thanks to its wide contact surface. pewag bluetrack flow-perfekt is a combination track that unites the best traction and soil protection features in a single track. Safe grip and the highest possible level of protection for forestry applications. How to mount a pewag bluetrack? Longer lifespan for the stubs, thanks to the increase in the hardened surface area, and higher wear volume due to pewag starwave® technology. Increased traction thanks to the two asymmetrical stubs which are standardly welded on pewag bluetracks. 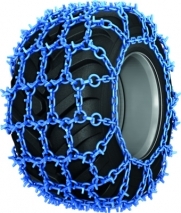 Improved wear resistance and extended lifespan thanks to a special hardening process for the connecting elements. pewag forstgrip comes with an asymmetrical stub arrangement in the running mesh, increasing grip and stability on rough terrain. When it comes to forestry applications, reliability and resistance are key factors to ensure safe and efficient working practices. pewag chains for forestry machines have an extremely high capacity for self-cleaning and are gentle on the subsoil thanks to their relatively low weight. 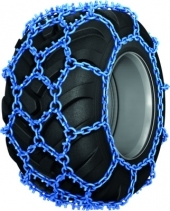 pewag forstgrip cross is the ideal chain for extreme applications and maximum soil protection. For your safe journey through the forest: pewag forstgrip. How to mount a pewag forstgrip? Good to know how to do! to find information material in other languages.